Newry City jump off bottom spot after an impressive 3-0 home win over Ards which means the North Down club are now propping up the Irish Premiership table. 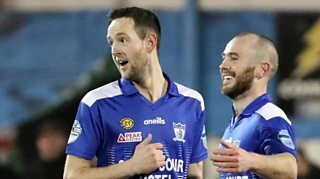 Stephen Hughes and Mark McCabe struck in the first half at the Showgrounds with Tiarnan Rushe adding a third with an excellent free-kick as Newry earned their first league win since November. Darren Mullen's men now sit one point ahead of Ards in the table with four games to go as the two clubs battle to avoid the automatic relegation place.